how do you bottle h2ope? how to you drink pure? how do you make a bottle disappear? 100% eco-responsible, recyclable packaging. Our bottle, made with an organic additive, is known to breakdown in landfill to harmless remnants in less than 5 years. 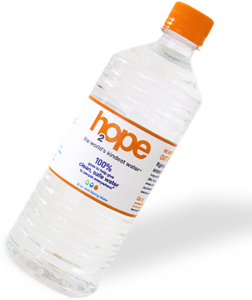 When you choose to drink h2ope, you quench your thirst for water. And you quench your thirst for change. In one easy step, you affirm the power of the individual to make a difference. When you reach for h2ope instead of another brand, you are reaching into your pocket for the same change you'd be spending on water anyway...but instead, you're reaching for change that will save lives around the world.